This is the part of the day when I make fun of my sister. She has lost two, that's right, two iPhones in the span of four months. She doesn't use a computer so Find My iPhone makes no sense to her. Maybe being hassled by the BungeeAir security bubble will keep her next iPhone in her pocket. Utilizing an iPhone case, key fob, and app combo, the Kensignton BungeeAir security system creates a wireless perimeter that once broken sounds sends an alert to the users key fob. The key fob (which looks like a car alarm key fob from 1997) vibrates and makes a cute beeping noise. The BungeeAir companion app can set the wireless tether distance and has the ability to autolock your iPhone once you move out of the security bubble. 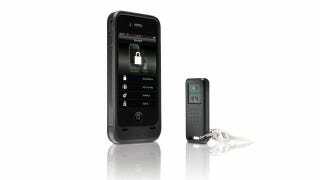 You can also lock down the phone remotely from the key fob. The fob can also be used to find your iPhone when you drop it between the cushions in your couch. And if you're always losing your keys, the find feature works both ways. Fire up the companion app and if you were smart enough to add the key fob to your key ring, you can find your keys from the app. So maybe my sister will finally be able to keep an iPhone for more than a few months. That is until she loses her keys, the fob and her iPhone at the same time.